Imagine hundreds of intricate, colorful paper sculptures filling the streets of Spain's third-largest city. Constructed in painstaking detail over the course of several days, the finished products tower over the spectators marveling at them from down below. Then, suddenly, these spectacular works of art are burned in epic bonfires that rage throughout the city as part of an all-night party lasting until dawn. 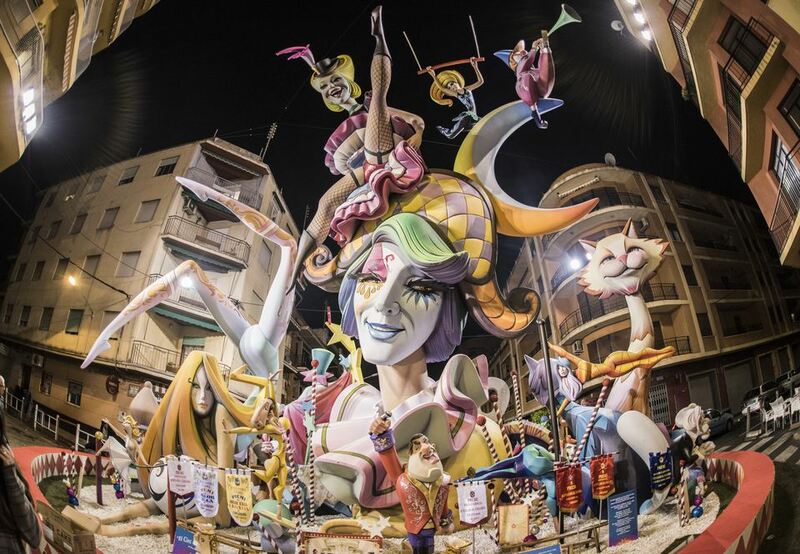 As the most iconic festival in Valencia (and one of the most famous festivals in Spain), Las Fallas is an exquisite sight to behold, and a true once-in-a-lifetime party. While the aforementioned giant paper sculptures and huge fires are the main draw, there's so much more to see and experience at this colorful, vibrant celebration. Here's what to add to your agenda if you'll be at Las Fallas, which takes place from March 15–19 every year. The main reason most people come to the Las Fallas festival is to witness the burning of the sculptures on the final evening. Starting small with the burning of the children's sculptures at 10 p.m., the fires get bigger and more epic throughout the night. The biggest and most important burning is that of the sculpture in the town hall (ayuntamiento) plaza, which usually starts around 1 a.m. As the final fire of the night, it brings with it massive crowds, music, and even its own small fireworks display. Let's backtrack a bit. Before they fall victim to the flames, the sculptures, or n​inots, are on display all over the city for all to see. There are hundreds of ninots, often towering more than 20 feet high and often depicting satirical takes on public figures and pop culture. Constructed practically overnight over the first few days of the festival, the ninots then are taken on parades throughout the city so that everyone can marvel at these stunning, unique works of art. Before the final burning takes place on the final night, attendees vote on one ninot to be saved from the flames and preserved in the Fallas Museum (more on that in a bit). If you've assumed that the Las Fallas festivities only take place during the festival itself from March 15–19, think again. Starting on March 1 and continuing every day until the end of the festival, an epic display of gunpowder explosions rips through the Plaza del Ayuntamiento at 2 p.m. Known as the mascletà, the explosions are set to heart-stopping rhythms and are not for the faint of heart. You can hear the mascletà from all over the city, but if you're up for braving the booms, be sure to head to Plaza del Ayuntamiento to see it up close and in person. Acrobats perform in the streets and there is a visual element of sorts to the fireworks as the rockets leave smoke trails as they are detonated. Forget to set your alarm after partying all night at Las Fallas? No need to worry—you won't need it. Partygoers provide their own despertà, or wake-up call, by dropping fire crackers outside people's windows at 8 a.m. After all, locals are proud to host this massive event, so there's no sleeping on their watch—they want everyone up and enjoying the festivities! This mischievous but well-intentioned tradition can take some getting used to. If you can't go back to sleep after your unconventional wake-up call, head out to your nearest cafe and enjoy some soul-warming churros con chocolate, or the more traditionally Valencian treats known as fartons with a glass of horchata. To really get into the spirit of the festival, try some buñuelos. The Las Fallas festival isn't entirely about noise and fire (though that is a big part of it). If the event piques your interest but you're not into the idea of late-night parties, the flower offering will be right up your alley. On March 17 and 18, thousands of locals make their way through the city dressed in traditional costumes and dancing to the music of the marching band following them. Their destination: Plaza de la Virgen, where they'll lay elaborate floral bouquets in front of the statue of the Virgin Mary. The procession starts around 3:30 p.m. and the festivities in Plaza de la Virgen often last well past midnight. This emotional and solemn event is one of the most authentic ways to immerse yourself in local culture during Las Fallas. Coming to Valencia a bit early? One of the most popular events in the leadup to Las Fallas is the annual JJ Dómine Port Paella Cooking Contest. While paella is often mistakenly considered a national dish of Spain, it's actually a regional specialty native to Valencia, and at its best in the region. The contest boasts more than 500 paellas every year, so you can decide for yourself which is the best of the best. 2019's edition is set to take place on Friday, March 8 along the promenade in front of the Grau train station. Foodies won't want to miss this once-in-a-lifetime opportunity to try Spain's most iconic dish at its best. In addition to the mascletà explosions rocking the Plaza del Ayuntamiento every day, partygoers can also enjoy a more conventional visual fireworks display at night. For four nights straight during Las Fallas, a massive fireworks show lights up the sky. While the spectacle is visible throughout the city, many locals gather along Paseo de la Alameda to watch the show. The biggest and most grandiose display takes place in the early hours of March 18. Known as La Nit del Foc, this breathtaking display of color and light is the only show of its kind in the world. If you think you've seen fireworks before, think again—you've never experienced a spectacle like this. One of the best parts of any festival is the traditional food associated with the event. During Las Fallas, that usually means buñuelos. You'll be able to find stands selling these tasty treats on practically every corner throughout the festival, and the heavenly aroma wafting from the carts makes them almost impossible to resist. If the buñuelos themselves (essentially deep-fried pumpkin doughnuts) don't sound absolutely mouthwatering, consider the fact that they're traditionally enjoyed dunked in sweet, thick, Spanish-style hot chocolate. You can't celebrate Las Fallas without indulging in this traditional delicacy at least once, and you'll be glad you did. Before the massive bonfires devour the awe-inspiring ninots on the last night of the festival, a vote takes place to decide which masterpiece will be spared from the flames. The lucky winner earns a spot in the Las Fallas Museum at Plaza Monteolivete, where visitors can experience this fabulous festival year-round. The collection of ninots here dates back to 1934, providing a fascinating look at how the style of the sculptures has changed over time. Ironically, the museum isn't easy to get to during the festival, due to the fact many roads in the city are cut off for the week, limiting the availability of public transportation. However, if you don't mind walking there (it's a little ways away from the city center), the one-of-a-kind collection is truly a sight to behold.